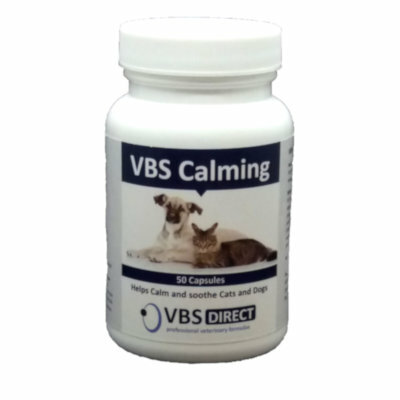 VBS Direct Ltd - VBS Calming Capsules - Innovative solutions for the veterinary professional. This product features pharmaceutical grade L-tryptophan, an essential amino acid which is converted to serotonin in the brain. In addition, the herbs ashwaganda, Chamellia sinesis extract and valerian root help soothe and relax naturally, effectively and safely. Capsules can be broken open, and contents mixed with food.